Hess' law states that, you can sum one more than one reactions to form new reaction. While doing this, you apply same changes also on enthalpy changes of used reactions. Following examples shows Hess' law in detail. to get enthalpy change of following reaction. In chemical reactions, you can sum each sides of reactions like mathematical equations. We sum reactions I and II, but result does not give us what question asks. Thus, we should do some other calculations to get wanted reaction. If we reverse reaction II and multiply it 1/2 before adding reaction I, we get wanted reaction. Enthalpy change of wanted reaction is 14 kcal. 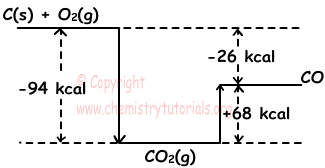 This reaction is not formation reaction since C(diamond) is not stable form of C.
This reaction is not formation reaction since 2 mol compound are formed. If we know formation enthalpy of matters, we can find ∆H value of reactions. Enthalpy change of decomposition of 1 mole compound into its elements is called standard molar enthalpy of decomposition. Standard molar enthalpy of H2O (l) is 68 kcal. It is the heat released from the reaction of one mole element with O2(g). Molar enthalpy of combustion of CH4(g) is -212 kcal. Most of the combustion reactions are exothermic. I. White and red phosphor are allotrope of phosphor element. Thus, they have different enthalpy. It changes ∆H of P2O5. II. Oxygen and ozone are allotrope of oxygen element. Thus, they have different enthalpy. It changes ∆H of P2O5. III. Enthalpy of P2O5 increases with increasing mole. It is the enthalpy change of neutralization of 1 mol acid and one mol base. These reactions are exothermic reactions.